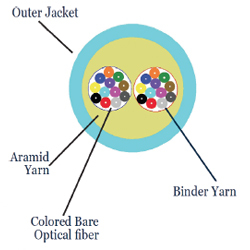 TLC High-Density Micro Distribution Cable is composed of two contrasting color bound bundles of 12 colored glass optical fibers, aramid yarn, and an outerjacket. TLC High-Density Micro Distribution Cable is available in 12 TIA standard colors or special-order colors. UL Listed OFNP cables are available. Standard surface print denotes construction, NEC rating and fiber type, and includes footage markers. Custom print can also be accommodated.